Olympic medallists Sushil Kumar and Yogeshwar Dutt on Wednesday promised that India would not return home from the 2016 Olympics in Rio de Janeiro with anything less than at least 5 medals, reports India Times. At the recent Wrestling World Championships in Budapest, Hungary, India secured 3 medals – Amit Kumar bagged a silver while Bajrang and Sandeep Tulsi Yadav won bronze medals each. India finished with three medals at the recently concluded World Championship at Budapest, Hungary. While Amit and Bajrang claimed medals in the 55kg and 60kg freestyle category respectively, Sandeep won India’s first ever medal in the Greco Roman style at the senior world event. “We are targeting at least 4-5 medals at the Rio Olympics. We have started preparing ourselves in that direction and we will settle for nothing less than a gold medal. The World Championship medals have changed the future of the Indian wrestling for the better. This will start a new culture of wrestling in the country,” Sushil Kumar, India’s most successful individual Olympian said sounding extremely confident. Yogeshwar said that the recent successes in Indian wrestling could be traced to a refreshed mentality that all the wrestlers possess, adding that they are all extremely hungry for success and not content with just participating in the major events. 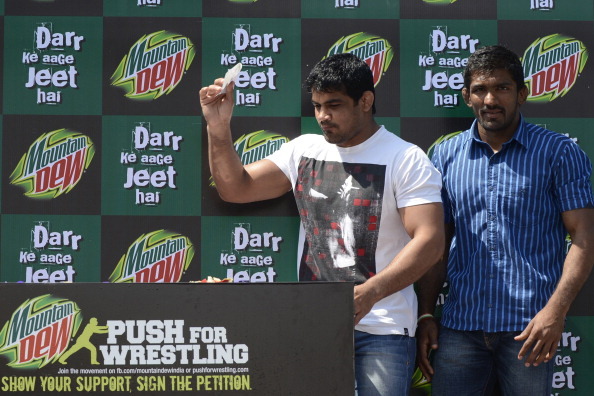 “Amit (Dahiya), Bajrang and Sandeep (Tulsi Yadav) have put the Indian wrestling on a different track. With the next line of wrestlers ready and raring to go, we are confident that India will bring home 4-5 medals from the Rio Games. We all are targeting gold medals as the recent success at World Championship has spurred us on,” he said. The two wrestlers did admit that their medal winning exploits at last year’s Olympics have played a key role in bringing about this change. “The emerging wrestlers took inspiration from our medals and results are in front of you. This augurs well for the Indian wrestling. They have the confidence to win major tournaments and it was evident in world championship,” said Yogeshwar. Amit Dahiya and Bajrang, in fact, dedicated their medals to their idol Yogeshwar, who hails from the Bhainswal Kalan village in Sonepat, Haryana. “Both these grapplers are just 19 years old and I can say our sport will be in able hands for years to come. Amit’s posture while standing and attacking style are his plus point while Bajrang’s leg defence and endurance level is very high.”, said Yogeshwar. The two wrestlers are looking to selectively pick and choose tournaments over the next year or so in order to stay away from injury. Next year is a big year for wrestling as the Commonwealth Games, Asian Games and the World Cup will all take place next year. “I will be participating in two-three tournaments this year to prepare well for the three events. There will be slight shuffle in the weight categories of all the wrestlers after the world body’s decision to reduce the number of existing seven weights to six. So, I am also waiting for the development to happen,” said Yogeshwar.